SOUR DOUGH BREAD – update to the sourdough bread recipe I shared 4 weeks ago. It has been a number of weeks since I started making this sourdough bread. I have probably made at least 3 batches a week now. Even when I don’t need bread, I do up a batch to use the sourdough starter and as well to share loaves with others who would like to try this bread without yeast. I am also making 4 loaves at a time now instead of 3. I decided to weigh each ball of dough; using 1 pound 3 ounces for each loaf. I like the narrow bread pans that are 4 1/2 by 8 inches at the top rim. 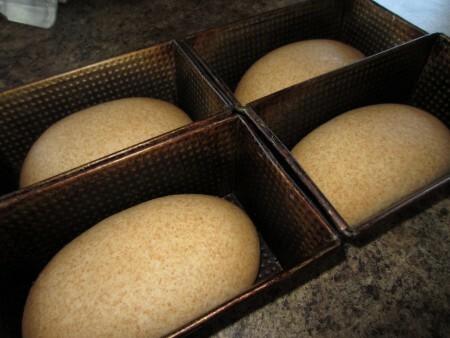 The loaves are easy to slice, they fit easily into the toaster and they make great sandwiches. Last week when I came to adding the unbleached flour, I added 2 cups and then added the next 2 cups without thinking. Well, the flour was too much so I had to take 1/4 cup starter and drizzled it over the bowl as it was kneading. It ended up being just the right amount. As well, when I divided the dough into 4 equal parts, I found they were each 1 pound 3 ounces. So now the last 3 times I have been using 3 1/4 cups starter and using all 4 cups of the unbleached flour. Of course I still watch to see that the batch is the right consistence because some starters are thicker than others. Even a few drops of liquid or a few teaspoons of flour can make the dough exactly right. Remove from oven and brush with oil or beaten egg. Lift loaves from the pans and let cool on a board before cutting into it. I found this to be very important. With a sharp serrated knife, slice the loaves thin. Package into bags as you wish and freeze the extra. This sourdough starter just added another dimension to my EAT MORE WHOLE GRAINS journey. Over the past weeks I have used sourdough to make pancakes, waffles, crepes and cinnamon buns. We are loving these recipes too! EAT MORE WHOLE GRAINS cookbook has over 200 of our favorite recipes that include nutritious grains & seed, but as well it includes recipes that omit or substitute other grains or seeds to provide for those who have allergies or are gluten intolerant. This cookbook includes instructions for kneading by hand & as well for kneading more quickly & easily in a Bosch or other dough mixing machine.